Home :: What Makes The Blue Tuxedos The Top Choice Of Apparels Among The Stylish Men? What Makes The Blue Tuxedos The Top Choice Of Apparels Among The Stylish Men? Mensusa https://www.mensusa.com/articles/ blue-tuxedos-the-top-choice-among-the-stylish-men.html What Makes The Blue Tuxedos The Top Choice Of Apparels Among The Stylish Men? The blue tuxedos are the delightful choice of apparels that complements all types of skin tones and serves as the relevant choice of apparel for arrays of occasions and events. It is for a span of centuries that the fashionable men had relied on the exquisiteness of the tuxedos in the instances of promenade occasions and special events. The trend continues even in today's time and hence, the market has the availability of some fashionable and stylish tuxedos. The blue tuxedos are indeed the top choice of apparels for the fashionable men. Blue is the shade that is most frequently picked by the fashionable men as the choice of shade for their apparels. 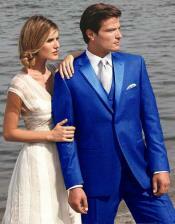 Let's discuss the reasons that make the blue shaded tuxedos such a popular choice of attiring. The shade blue features tranquility, depth, and elegance. Hence, the blue tuxedos appears to be classy and sophisticated. No matter the event or the ambiance that you attend, in order to appear impressive, you have to inevitably display gravity and grace in you look. The blue shaded tuxedo is the ideal choice of apparel to accomplish those objectives. The eye-catching yet soft look of the blue shade makes these tuxedos uphold your mature sense of dressing and fashion pursuits in a style that you will surely get the attention and focus of the crowd revolving around you. The fashion experts advocate that you should choose the shade of the apparel in a style that it can complement your skin tone. If the color of the apparel suits the complexion of the wearer, he will definitely appear appealing. Blue is a shade that complements the lighter as well as the deep skin tones and hence, it is a universal color of the apparel that you can get. Still, it is important to make some adjustment on the shade of blue and pick the one that best fits on your complexion. The soft and sober appearance of the blue tuxedo makes it apparels that fit wearing across arrays of occasions. While you can pick the lighter shade of blue for the formal as well as daytime occasions, the deeper shade will be the right choice to pick for the promenade occasions and special events that get hosted during the evening time. Hence, having the blue tuxedos in your collection, you are having the most comprehensive apparel solution for the arrays of dressing needs. www.mensusa.com offers delightful collection on tuxedos as well as other apparels and fashion accessories for men. The store deals with the fashion products from the top brands and hence, the buyers are assured to get the best quality products. The best part about this store is that it offer this premium collection at the most competitive rates.